Host to the Great Barrier Reef’s largest lagoon and one of the best overall budget options for those looking to get a sampling of a quality reef environment, Lady Musgrave Island offers an amazing snorkel and dive destination – particularly for beginners – all at a relatively reasonable, bare-bones price with operators Lady Musgrave Experience departing from Bundaberg, and 1770 Reef Tours from the Town of 1770. As a result, it’s the perfect beginner-friendly island reef destination for first-timers. A prominent coral cay in the Great Barrier Reef’s southern section, Lady Musgrave Island brings along with it the characteristic high visibility levels one can expect of the south reef. While its marine life is diverse and plentiful, it’s the lagoon that helps set Lady Musgrave apart from its counterparts; it offers a great combination of both size and safety alongside impressive coral cover with a good mixture of both hard and soft types to encounter. What does 1770reef do and Why us? 1770reef provides access to one of the most pristine areas of the Great Barrier Reef – Lady Musgrave Island, Lagoon and Reef. The Town of 1770 is the closest port by sea, to visit the Southern Great Barrier Reef – Where Great Begins. 1770 is the closest access to Lady Musgrave Island being a short 1.5hr approx to Lady Musgrave Island part of the Southern Great Barrier Reef, 1770reef departs daily from the 1770 Marina. We give you a day where memories and special life changing moments are made that last a life time, new friends gained and loads of fun to be had. 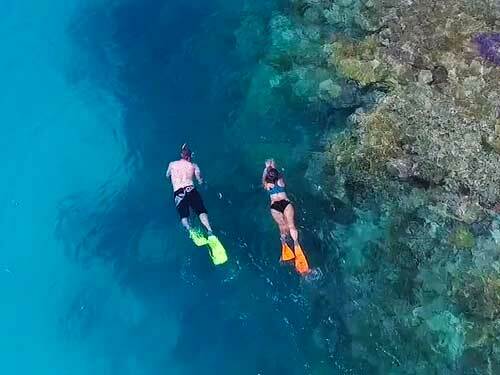 Snorkel the clear waters of the lagoon, swim with the multitudes of colourful fish and hang out with the turtles and have your turtle selfie, experience the Manta Rays. Visit Lady Musgrave Island for a guided walk and enjoy a coral viewing tour on the glass bottom boat without getting your feet even wet. The magical turquoise, blue waters of the lagoon greet you on arrival. What a sight, time to get the cameras’ out and start gathering your memories to share with friends and family. Tick the Great 8 off your bucket list – a chance to see turtles, clown fish, giant clams, sharks, potato cod, Manta Rays, Maori wrasse and whales in season. There are over 1300 varieties of reef fish and over 350 species of soft and hard corals to enjoy under the clear waters of the lagoon. On the island of white coral sands and pisonia forest live a large population of sea and shore birds. Did you know that some of the birds migrate all the way from Siberia to next on these coral cays each year? Who wouldn’t want to join the fun boat – Emelie – with her passionate, experienced, local crew members sharing their knowledge and love of their office for the day.